Eternal Peace left the following request: "I love denim blazers and I remember a few years ago they were selling them everywhere but I don't see them around no more, I want one for this spring!" Eternal Peace must know that blazers are going to be a key item this spring. This season, wear your denim blazer over a flowery tea dress for a relaxed spring style. I searched all the high street stores I could think of, and unfortunately there are very few around! The only shop that does a denim blazer at the moment is Next (no. 5). Hopefully more will turn up later into the season. As an alternative to denim, try a light blue striped blazer instead (no. 4 and no. 6). I spotted one of these in New Look recently as well. Left to right: D&G £265; Bonprix £11.90; Bonprix £24.90; Debenhams £40; Next £40, Next £30. 2) You can pretty much match anything you plan to wear under. 1) Too warm for summer time. I guess it's time to shop for cotton cardigans. 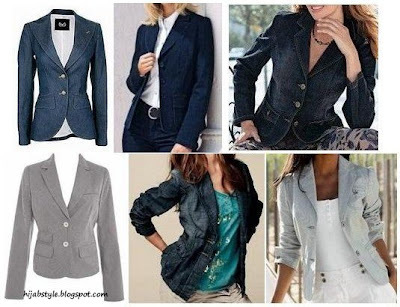 Yes denim blazer are fab! It won't be getting hot here for a quite a while I expect... it's snowing again! Denim will come: all the runways, including Chanel featured 'em so they'll turn up.